The function of the shutoff valve on undersink reverse osmosis units is to stop the flow of water into the unit when the storage tank is full. To the shutoff valve, full means when the pressure in the tank reaches about &frac23; of the pressure of the tap water coming into the unit. In other words, if your home's water pressure is 60 psi, your RO unit will stop making water when the pressure in the storage tank reaches about 40 psi. There are two general patterns of flow. In some valves, the water flows in a horseshoe pattern, entering the valve, making two 90° turns, and exiting through a port on the same side. We call this pattern the Payne style. With the other pattern, which we call Flowmatic style, the water enters the valve, flows straight through and exits the other side. Either style will work on your RO unit, but it will be a little easier to replace your current valve if you choose one with the same flow pattern. 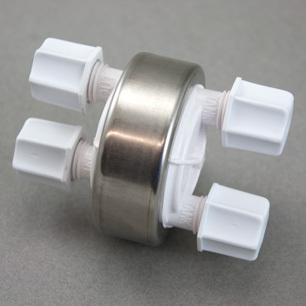 We offer both styles with Jaco type compression fittings or John Guest type quick connect fittings.